"The Little Mermaid", The Hudson Backstage Theatre, Hollywood, Life In L.A.
1) I am passionate about the subject matter and would relish the opportunity to exploit that passion and learn more (usually the case). 2) The pay is just too good to turn it down (rarely the case). 3) I can make my girlfriend happy (very rarely the case). It is to the third point that I found myself, along with my girlfriend, at the Hudson Backstage Theatre this past Saturday night to attend the limited-run of D.E.E. Studio Productions Performing Arts Academy’s performance of Disney’s The Little Mermaid. Thankfully, Horak casted accordingly, and Arial, played by the spirited Kelly Boardman, delivered all the notes needed to satisfy all those present who, like my girlfriend, have had “Part of Your World”stuck in their head for the last twenty years. Meghan Muriset, playing the role of the villainous Ursula, was exemplary, adding a gaudy touch of evil to the character, offering two of the most memorable moments with her performance of the wonderfully boisterous“Poor Unfortunate Souls”, as well as “I Want the Good Times Back”, easily the best song of the new numbers written for the Broadway version. For the male roles, I had forgotten that while Prince Eric, played by the talented Dade Elza, is the story’s deuteragonist and love interest, the most demanding and present male character is easily Sebastian, the crustacean composer, captured quite enjoyably by Kenny Copeland Jr., whose Jamaican accent was as solid and unwavering as his enthusiasm throughout the show. He deftly carried what are probably the most popular two songs from the film, “Under The Sea” and “Kiss The Girl”, songs that were not only legitimate hits for Disney, but also were nominated for“Best Original Song” at the 1990 Academy Awards. If you’re like me and think you’ve only watched the movie like twice in your life and there is no way you know all the words, you will soon find yourself very wrong. Much credit must also be given to the remaining cast, most of whom were merely teenagers. For some, it was their first real stage production, though you would never be able to single out anyone in the cast as being amateur. The zeal and commitment displayed by the entire cast showed the audience that the enjoyment of the performance was shared by both sides of the stage, and as I exited the Hudson Theatre, after witnessing the “love makes anything possible” nuptials of Eric and Ariel, my girlfriend stopped, turned to me, gave me a thankful kiss, and proceeded to recall her own medley of the show and I realized that the show did everything it was supposed to do. She was happy. So if you asked me now what are the odds that would I see another performance, I would say they have greatly improved. Hudson Backstage Theatre is located at 6539 Santa Monica Blvd. The theatre has a range of shows, seven days a week. For more information on Hudson Theatres call 323.856.4252 or visit www.hudsontheatre.com on the web. There have been plenty of comedies throughout the years that end up becoming instant classics. Comedies you can watch over and over that always deliver the laughs. Mel Brooks’ "Young Frankenstein" definitely belongs on the list of timeless funnies. Well, if you’re anything like me, the addition of song and dance to just about anything makes it all the more engaging; and this was definitely the case with the live production of"Young Frankenstein: The Musical." Like the film, the story follows Dr. Fredrick Frankenstein (or Fronkensteen as he insists), a young scientist who has spent the majority of his adult life running from his grandfather’s legacy and reputation. Upon his grandfather’s death, Fredrick inherits his castle and assets and soon finds himself in Transylvania. With the help of a lovable hunchback, Igor (pronounced eye-gor) and a beautiful lab assistant, Inga, he soon finds himself deeply immersed in his grandfather’s work -- the reanimation of dead tissue. Picking up where he left off, Dr. Frankenstein succeeds in creating a "monster," but unfortunately things from there do not go as planned. A parody of Mary Shelly’s "Frankenstein," the film and show stay true to the original macabre material, with plenty of laughs and catchy music along the way. Playing at the Hudson "Backstage" Theatre this past weekend, "Young Frankenstein The Musical" was monstrously delightful. From the talented and passionate actors to the stunning set, this show was nothing short of mesmerizing. Written by Mel Brooks, with music and lyrics by Brooks and Thomas Meehan, "Young Frankenstein The Musical" has everything a theater director wants in a musical script; and Hudson Theatre director Nancy Horak did a fantastic job of bringing the show to life. It also did not hurt to have great actors to fill the parts. Justin Haase took on the lead, playing Dr. Frankenstein with a passionate fervor that screamed comedic genius. I found myself enchanted by his character as he dove deeper and deeper into the mind of a true mad scientist. Jolie Vanier as Inga was just delightful, making her offer of a "roll in ze hay" simply impossible to resist. Deidra Mohr played Frau Blucher, the castle’s unsightly housekeeper. While her character’s revolting looks are enough to make horses rear up in fright, Ms. Mohr’s performance is magical. Roger Lott did a fine job of portraying the Monster; making the most of the abnormal brain he was given. Looming high above his cast members, he made his massive presence on stage just the right combination of comedy and menace. Igor was portrayed by Nicolas Henry, a newbie at the Hudson Theatre, and perhaps one of the cutest and smallest actors I have ever seen. He had very large shoes to fill taking on this role, and was very effective in doing so. With an equally impressive ensemble cast playing various parts throughout, I was captivated time and time again. The actor who left the greatest impression was Adrianna Eldridge, who played Dr. Frankenstein’s over-the-top socialite, fiancée Elizabeth. If her exquisite singing voice, brilliant line delivery, or sheer way of lighting up the stage were not enough, let’s add in the fact that she is only thirteen years old. This bright, young girl projected so much professional talent and star quality I’m sure we will be seeing her on Broadway in no time. Ms. Eldridge was truly the star of the show. The set and art design was some of the most impressive work I have seen at a small production. Artist Heli Sterner did a superb job of painting backdrops for the audience that transported us straight to Transylvania. From the exterior of the Doctor’s castle to the inside of his laboratory, Sterner captured the beautiful gothic spirit of the time period and landscape, elevating it with mastery and beauty. Attending the closing show, I was privy to Ms. Horak’s emotional farewell to her cast members. The mutual respect and love between the director and her troupe shone through, not only touching the hearts of the audience, but making the performance that much more special and memorable. 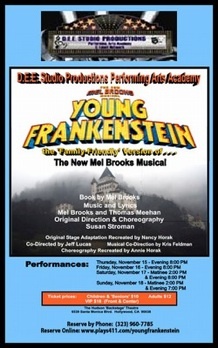 "Young Frankenstein The Musical" is a shining example of community theatre that is doing it right. A small group took on a huge project with this musical, but with devotion, passion and raw talent they created a masterpiece...or should I say "monster-piece." "Young Frankenstein: The Musical" ran through Nov. 18 at The Hudson Theatre, 6539 Santa Monica Boulevard in Los Angeles. For information of their upcoming performances, please visit: http://www.hudsontheatre.com. Undertaking Charlie and the Chocolate Factory has so many dynamics when you are trying to bring it to the theatre, young kids, endless props and bizarre settings. Trying to pull it off can take some of that Willy Wonka magic. Nancy Dee Horak pulled off that trick this weekend with her version of the famous movie at the Hudson Theatre in Los Angeles. 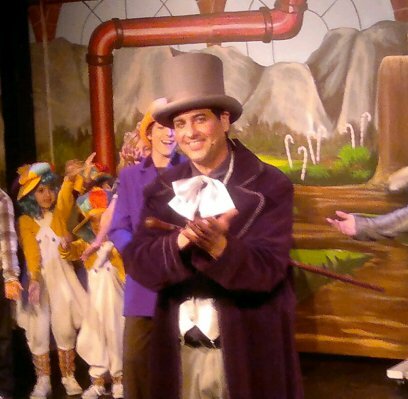 Charlie and the Chocolate Factory is about the hopes and dreams of a young boy named Charlie, played Jance Enslin. Charlie is wide eyed and just happy to be there as opposed to the other four very spoiled, misbehaving children. Jance had the soft-spoken and humble characteristics of Charlie down perfectly and he and Justin Hasse, Grandpa Joe, made for a fabulous team that managed to make it to the end of the tour to find out what Willy Wonka had in store for them. If you were a fan of the original movie the performance of Jolie Vanier would have taken your breath away. Jolie looked as if she stepped right out of the original film version as she had the selfishness, mannerisms, facial expressions and voice that were pure Veruca Salt. Jolie really captivated the audience with her solo, putting on the ultimate Veruca tantrum, demanding that her daddy buy her a golden goose. All of the characters were a joy to watch and each one was able to bring to life what they brought to the big screen. Jackie Rutan with her incessant gum-chewing and accent that was all Violet Beuregarde, Sergio Mendoza and his nonstop worrying about what was to eat pulling off Augustus Glump and Evan Hannemann as they annoying Mike Teavee, riling up Willy Wonka at every turn. We can’t forget about Willy Wonka himself, Jeff Lucas. Trying to fill the shoes of Gene Wilder is quite a task, but Jeff was up to it. His quick wittedness and interaction with all of the children was spot on. He really was Willy Wonka. While sticking mainly to the original movie, Nancy certainly took her creative liberties and they all paid off as her tweaks to the production only added to the laughs. The most entertaining addition to the play was the addition of a narrator. Aubrey Frail filled that roll and along with the Ooompa Loompas, garnered the most laughs on the evening. The narrator dressed in an off the wall outfit to fit perfectly in the Willy Wonka world we were in, had some of the best lines of the night and needed no words to entertain the audience as she introduced all the ticket winners. Her gestures and facial expressions as each golden ticket winner introduced themselves let you know what disdain she had for each one. Nancy also added the “Wonka Divas” to keep the audience entertained during set changes. The four talented singers belted out hilarious song after hilarious song, taking shots at each of the naught children. The set changes came often as you went from the bedroom of Charlie's house, to the factory and every part of it. They even had the edible tea cup, such detail was appreciated. Finally you have to give a lot of credit to Nancy and her Ooompa Loompas, a group of very young children that ranged all the way down to four years in age. You could not help but wait to see what the Ooompa Loompas were up to next, from songs, working in the factory and the best scene when one Ooompa Loompa was paddling faster and faster in the Willy Wonka boat, they did not miss a beat. Taking in such a well done performance, you realize that while the movie version of Charlie and the Chocolate Factory left that long lasting impression that something unique and memorable always does, the stage version left me with just as many fantastic memories, maybe even a few more.